Elk is not among the most commonly raised and consumed meats in the United States, but there is a market for the game meat. Many farms raise elk to sell as food, and in some parts of the country restaurants offer elk steak as a main course. This meat has a different taste than beef -- which some consumers find preferable. Healthy eaters may also appreciate that elk meat is considered a valuable source of protein. A 3.5-ounce serving of free range elk meat, or roughly 100 grams, is relatively low in both calories and fats. One serving contains about 148 calories, according to the U.S. Department of Agriculture's National Nutrient Database. Of these, 26 come from fat, which comprises about 3 grams -- about 6 percent of your daily fat allowance; only about 1 gram is saturated. This an insignificant amount of fat, and far less than the same-size serving of beef, which has 8.2 grams of fat, 3 of which are saturated. One of meat's greatest contributions to your diet is its high protein content. 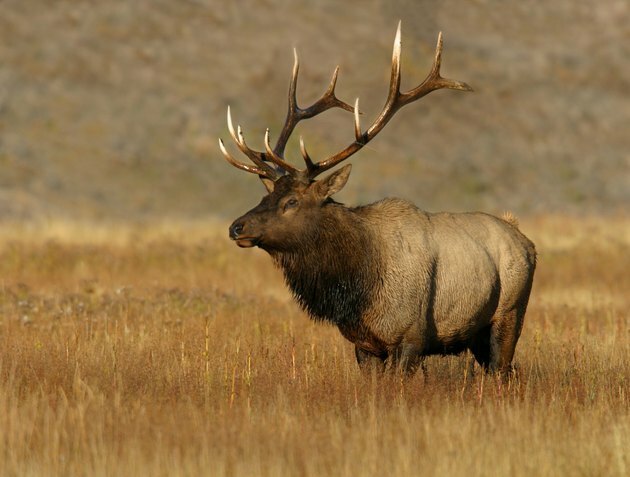 In this regard, elk products can meet and even surpass the protein content of other types of meat. Although the exact protein content can depend on the type of meat and fat content of the cut, the average cut of elk meat contains about 30.6 grams of protein per 3.5-ounce serving. This is slightly more than chicken and several grams per serving more than beef. Harvard School of Public Health reports that protein foods can help lower your risk of heart disease, diabetes, osteoporosis and cancer. Elk meat also features several vitamins, including over 100 percent of your daily recommended dose of vitamin B-12, 15 percent of iron, 20 percent of thiamine, phosphorus, zinc and vitamin B-6, 45 percent of riboflavin and 30 percent of niacin, according to the Grande Premium Meats website. Vitamin B-12 can help reduce your risk of heart disease and dementia and increase your energy levels, according to the National Institutes of Health Office of Dietary Supplements. Elk is very high in selenium, phosphorous and zinc. Zinc helps boost your immune system and reduces the length and severity of the common cold. Elk meat features no carbohydrates, including sugars and dietary fiber. Each serving has over 60 milligrams of cholesterol, or 21 percent of your daily recommended allowance -- not a small number, but on par with other types of meat. By contrast, elk is very low in sodium, at 65 milligrams, or 3 percent, of your daily recommended limit. Although the recommended intake or sodium is 2,300 milligrams per day, the American Heart Association recommends you aim to eat only 1,500 milligrams per day. Excess sodium intake can increase your risk for heart disease, high blood pressure and stroke. In addition to its health benefits, some consumers find elk meat to be more flavorful and appetizing than beef. To some degree, the health value of any meat is influenced by the chemicals, hormones and other additives used to improve the quality and lifespan of the meat, and the same is true for elk meat. Elk meat is not the cheapest form of meat and not found everywhere, but it can often be special-ordered through a grocery store, butcher or private farm. What Meats Are High in Protein and Low in Calories?